Our guitar duo began as a surprise consequence of a previous project: the recording of "The soul in the roots, Leonardo Bravo plays Marcelo Coronel" (EPSA Music Buenos Aires, 2000, Guitars of the World collection). The time we spent during the making of that CD left us with a desire to continue indulging in the joy and pleasure of making music together. And so just like that, we very casually teamed up to play guitar as a duo. Every musical project develops around a certain aesthetic, a discussion of the language to be used. In this case, we chose to build a repertoire based on the traditional as a way of returning to our roots. 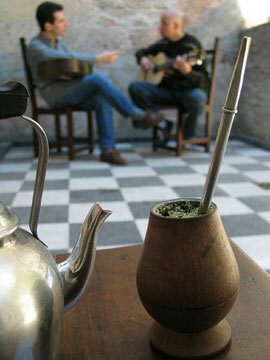 The first piece that emerged was a "Gato" (Cat), the product of a long afternoon of Mate tea and guitar, and as our first it received the name of our duo (or perhaps our duo received the name of the piece, nobody knows at this point). The other pieces emerged soon thereafter, products of our collaboration, as well as our creative powers as individuals. This is the culmination of several years of work as a duo, which in addition to our musical accomplishments leave us with numerous life experiences. As our paths now diverge, only time will tell if the strings of our guitars will interlace once again. In the event that this does not happen, we leave you with this music. When the performers catch the sonority, the character and the phrasing typical of a style (that is to say the "further away" of what is written) and having the necessary resources express it with naturalness and feeling, an immediate and happy communication with the listener takes place. 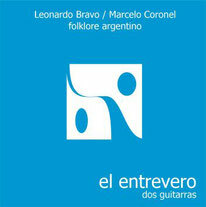 That is what I perceive in this recording of Duo El entrevero. Everything is grace and truth, on the basis of a delicate aesthetic work of creation and an ensemble of great ripeness. I have no doubts that the diffusion of this CD will bring very beneficial quality and identity to the musical scene of the contemporary guitar, in our country and wherever it is listened. It only remains for me to thank Leonardo and Marcelo the fact they have included two pieces of mine -one of which, "El prometido", is dedicated to them- and to wish them the success they loosely deserve. Walter Heinze, Paraná, January of 2005.